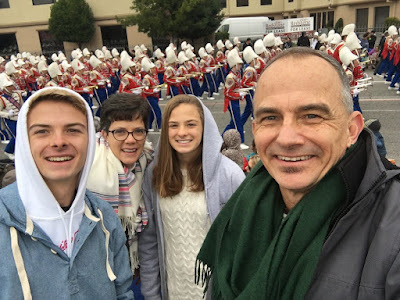 On New Year's Day, my wife, teenage kids, and I drove down to Los Angeles to see the Tournament of Rose (more commonly known as the Rose Parade) in Pasadena. The Parade is normally held on New Year's Day, except when January 1st falls on a Sunday, as it did this year. So, technically, we enjoyed the Parade on Monday January 2nd. Above, a detail from one of the many floats, this one "Prosperity in the Wild," sponsored by Western Asset. Every square inch, including the face and bodies of the tigers, is covered in flowers or organic material. Here's another view of "Prosperity in the Wild" - which was awarded Directors’ Trophy for outstanding artistic merit in design and floral presentation. Floats are sponsored by either corporations, by service organizations, or by local Los Angeles area cities. The City of Downey out did themselves again, this year with "The Gold Rush." This float had an actual working roller coaster style mine cart as the rolled through the streets of Pasadena. Here's a link to a 30 second video of the mine cart in operation. Downey was awarded the Governor’s Trophy for best depiction of life in California. 24 organ, eye and tissue transplant recipients rowing in unison made up the "Teamwork in Life" float sponsored by Donate Life California. This is a great example of a float sponsored by a service organizations. 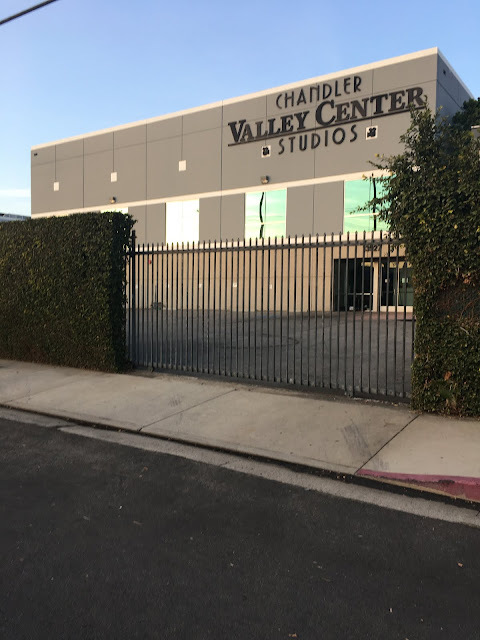 The City of Burbank's delightful "Home Sweet Home." Burbank is adjacent to the northeast border of Los Angeles, on the eastern edge of the San Fernando Valley, and it home to both Warners Brothers and the Walt Disney Studios. 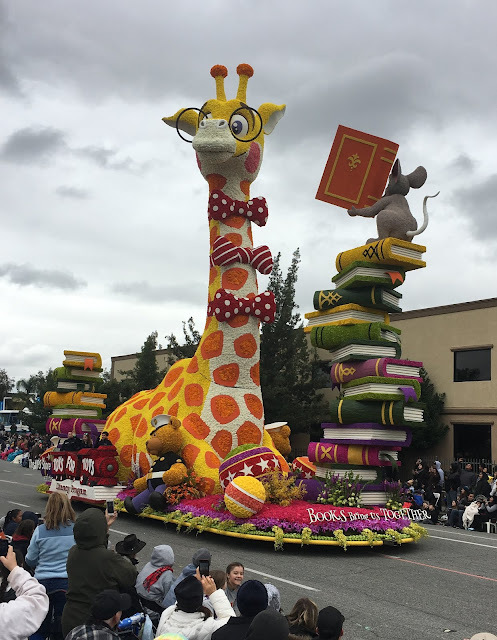 Like other cities that regularly participate, Burbank's float is paid for entirely through donations, and designed, built and decorated entirely by volunteers. One of the huge myths about seeing the parade is that you have to camp out the night before, or get there at the crack of dawn, to get a viewing spot. Not so. Sure, some people camp out on Colorado Blvd the night before, or get up at 4am, for a choice curbside seat. Others pay the big $$ for a bleacher seat along Colorado Blvd closer to the start of the parade. Meanwhile, we got a good night's sleep, leaving our hotel in Woodland Hills at a very reasonable at 8am. 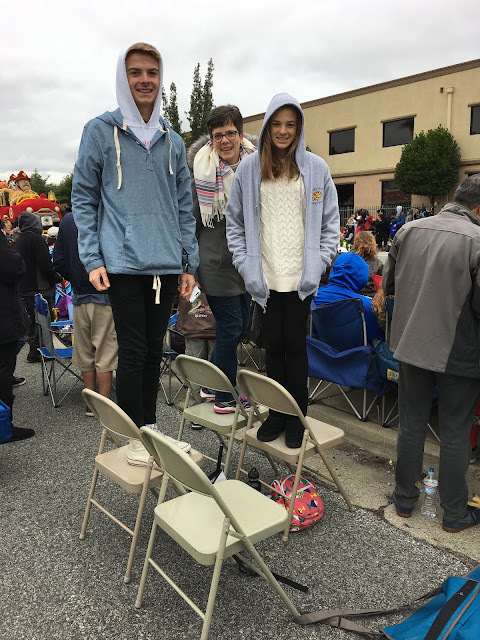 No traffic - so got to Pasadena by 8:30am, and found a great spot on Sierra Madre Blvd around 9am, with our metal folding chairs. The Parade begins at 8:00am in downtown Pasadena, taking 90 minutes to arrive where we were. Very doable! Above, 24 Hour Fitnesses' Crown City Innovation Trophy for best use of imagination and innovation to advance the art of floral design. Here's another commercial float: the "Spirit of Hawaii," sponsored by Dole, winning the Sweepstakes Trophy for most beautiful entry in the parade with outstanding floral presentation and design. 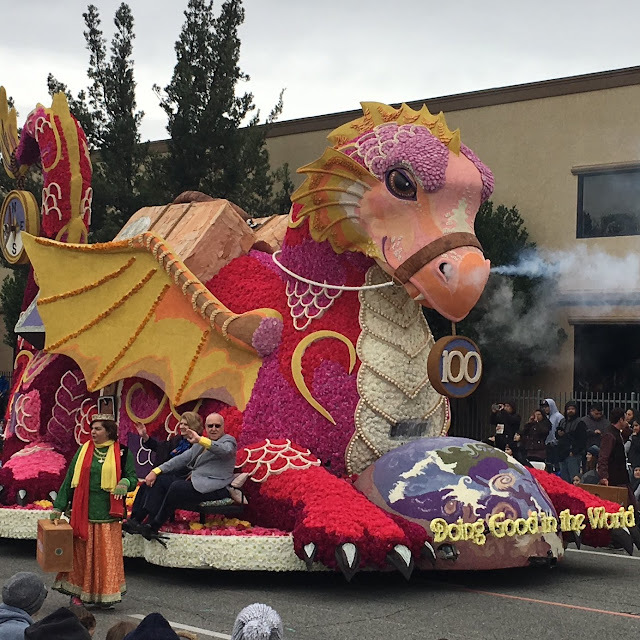 And another service organization float: "Doing Good in the World," sponsored by Rotary's International, and winning the Princess Award for the most beautiful float under 35 feet. Detail from the Monkey King float. 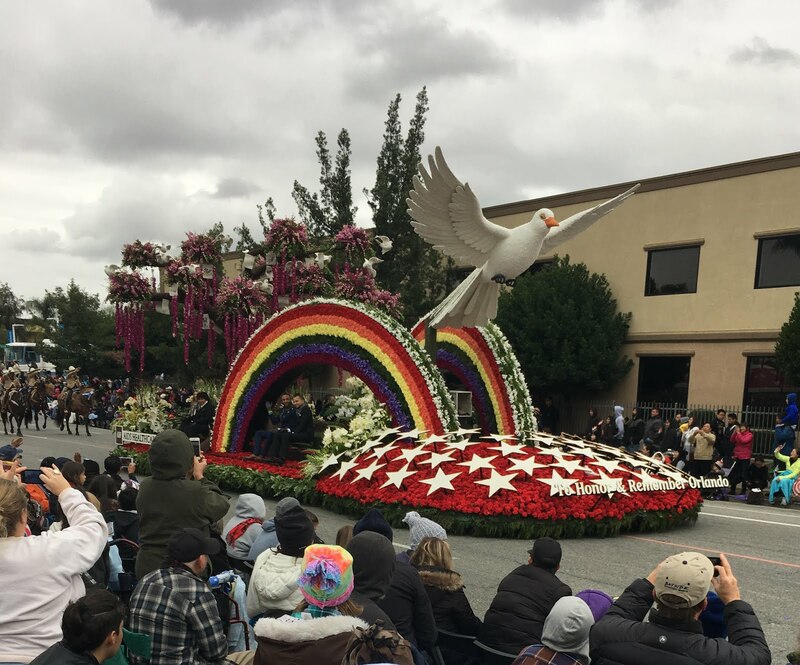 The American Armenian Association's "Field of Dreams" float, winner of the Past Presidents Trophy for most creative design and use of both floral and non-floral materials. Metro Los Angeles is home to the largest Armenian community outside of Armenia, with nearby Glendale being really the hub for the Armenian American community. Northwestern Mutual's "Waves of Hope," winner of the Animation Trophy, for - of course - best use of animation. We've been to the Parade many times, especially when we lived in Los Angeles. Here's a link to some photos from back in 2010. Most years it was sunny and warm - Chamber of Commerce weather. This year, it was in the mid 50's - which would be balmy in New York or Chicago, but pretty chilly by Southern California standards. The scarfs and hoodie were't for show. Of course, those marching along the six mile parade route no doubt appreciated the cooler temperatures. Behind us, one of the many outstanding marching bands. Every year there's one float this really stands head and shoulders above the rest. This year it was the creative and whimsical Books Bring Us Together, sponsored by The UPS Store. The float was designed to spotlight The UPS Store's ongoing support of the Toys for Tots Literacy Program. 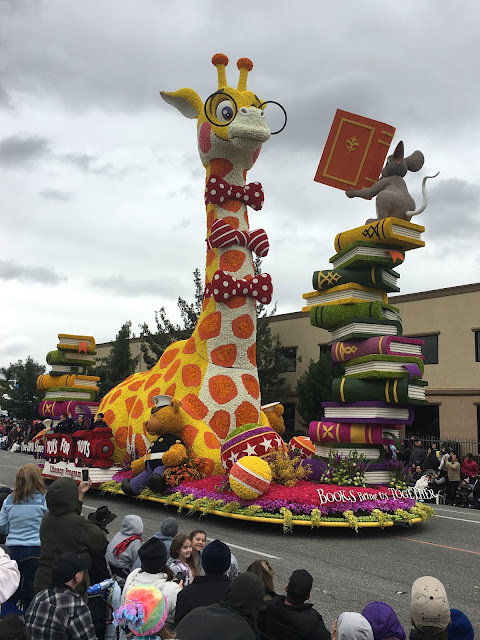 The float was awarded the Isabella Coleman Trophy for best presentation of color and color harmony through floral use, and featured a 42 foot tall giraffe. Really outstanding. I actually followed this float a couple blocks, taking additional photos. Love it. Not all floats are whimsical and fun. The AIDS Healthcare Foundation sponsored "To Honor & Remember Orlando" in memory of the 49 individuals killed, and 53 injured, in last June's terrorist attack/hate crime in Orlando. 49 doves were released as the float. 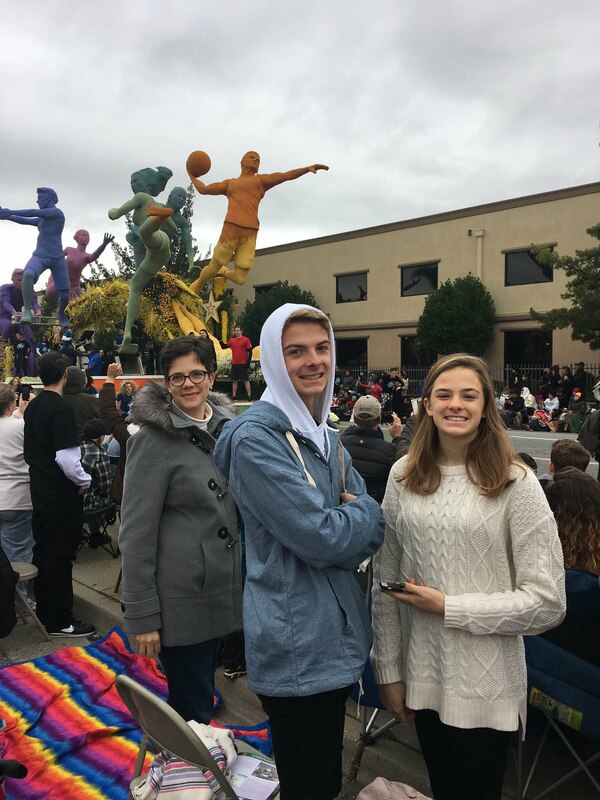 The float was a sobering reminder of the deadliest terrorist attack on US soil since September 11th, 2001 - and the deadliest incident of violence against LGBT people in US history. The float was also awarded the Lathrop K. Leishman Trophy for most-beautiful noncommercial float. Some commercial floats are subtle, some not so much. The California Milk Advisory Board's "Legacy of Generations" felt a bit like rolling billboard. Got to love the chunky milk coming out of the bottle - doesn't that mean it's way past it's expiration date? In contrast, the Ragu Pasta Sauce "Simmered in Tradition" - also promoting a food product - took a much more subtle, and in my opinion more effective approach. Sure, there's a plate of spaghetti towards the front of float, but it's not the main focus. 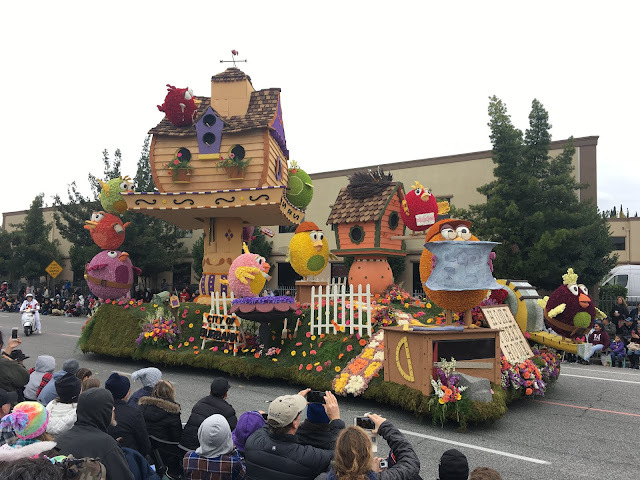 The float won the National Trophy for best depiction of life in the U.S.A., past, present of future, and featured a farmhouse and fanciful tomato vine along with birds and butterflies. In many ways, this float - as well as several others - remind me of one of the Apostle Paul's sermons in the New Testament. I suppose I'm unique, I tend to think about this sort of thing a lot. Joy. And beauty. A common argument against Christianity is summarized in the simple "what about suffering?" In other words, if God exists, why is there suffering? Perhaps a more difficult question - at least philosophically - is "what about beauty?" If God doesn't exist, how do we account for the beauty we see around us? Or life itself. Why is there something - rather than nothing? I doubt the good people at Ragu were thinking much about theology - or the provision of God - when it came to the design of this float. Yet, it's still there. This float and others pointing to the natural world around us and the Providence of God can't help but point to the reality of a Creator. Certainly, Christianity is more than acknowledging the existence of God. But it's a starting place. A final closeup. Well done, Ragu. I have never watched the TV show The Bachelor, but I like their float. Apparently, so did the judges. Their float "Echoes of Loves" was awarded the Princess’ Trophy for most effective floral use and presentation. Here's some additional details of "Echoes of Love." As stated earlier, every square inch of a float needs be covered by flowers or organic materials. For some reason a small door was open as it cruised by. Check out the driver (with the headset) in the center of the photo. California Polytechnic Universities float "A New Leaf" was awarded the Founders Trophy for the most beautiful float built and decorated by volunteers from a community or organization. Cal Poly is the ONLY university to regularly have a float in the Rose Parade. Since 1949, the float has been a team effort of the two university campuses: Cal Poly San Luis Obispo and Cal Poly Pomona. The two campuses are 240 miles apart, and over the years their floats have won over 50 awards. Way to go, Cal Poly! A final float photo: "We Came, We Saw, We Covered" by Farmer's Insurance. Along the six mile parade route, the massive RV would rise up and then go back down to "cover" a group of dogs on vacation. Everyone wants to make sure they're "covered" (insured) right? Cute play on words. Farmers took the the Grand Marshall’s Trophy for excellence in creative concept and design. And a final tip: we highly recommend bringing metal folding chairs. Sure, they're not as comfortable as cloth camp chairs - but the key is that you can stand on them. As long as you're not blocking anyone else's view, this allows for excellent viewing. And, if you get tired, you have a place to sit. All the photos on this post were taken from standing on a metal folding chair with my iPhone. So, yeah, it works. 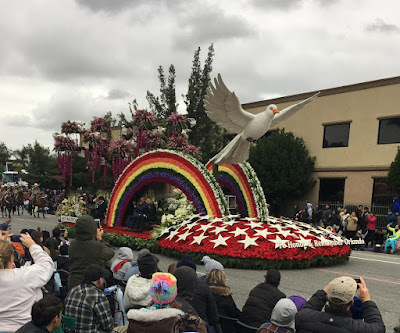 Here's some additional thoughts on the Tournament of Roses (the Rose Parade) from a previous post. More to see in Pasadena after the Parade, and in Los Angeles that afternoon. That'll have to wait until next time. 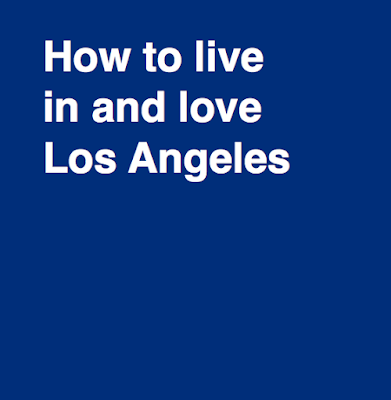 What does it mean to live in and love Los Angeles? 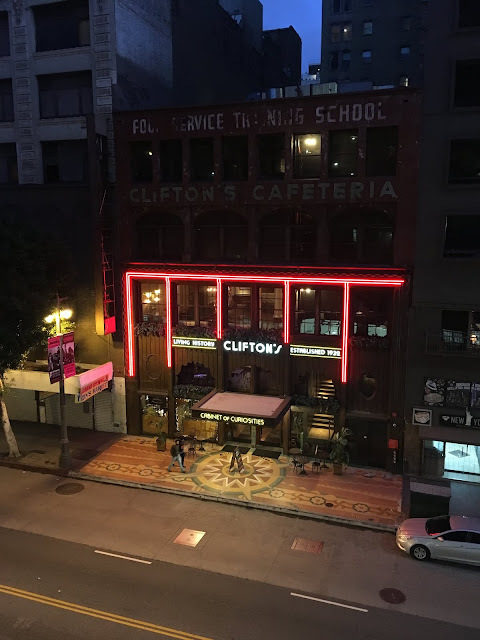 Last June, my wife, teenage kids, and I spent the a few days in LA/Orange County. 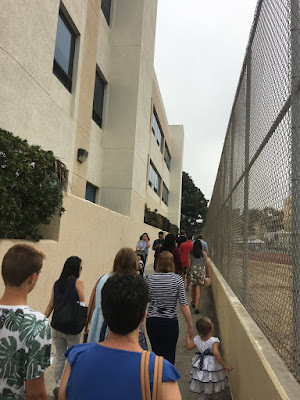 We drove down early Friday, walked along Swarthmore Avenue in Pacific Palisades (before the big Caruso Project took out the entire block), spent some time in Westwood and at UCLA, saw the La Brea Tar Pits, Urban Light and Levitated Mass, and drove down to Orange County. Saturday, we spent a full day at Disneyland and the Disney California Adventure. 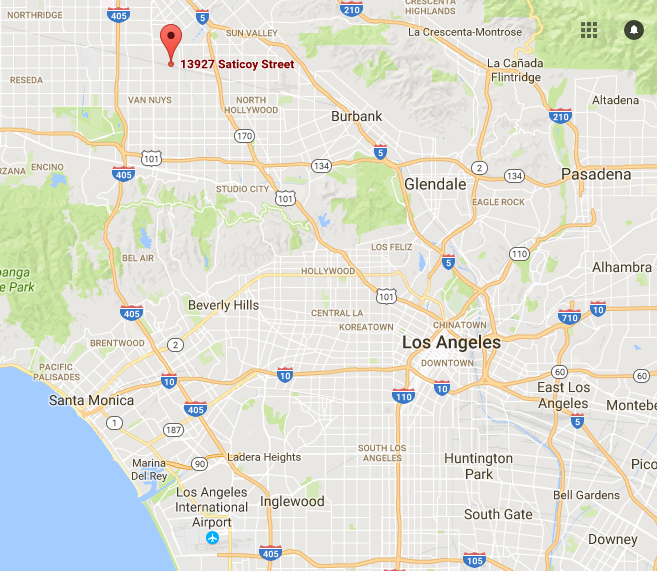 We lived in Los Angeles for a five years - when my kids were much younger. Now, our time there is just as visitors, seeing friends or cherry picking a few fun things to see and do. But if you're more than "just visiting" - what does it mean to live in and love a city like Los Angeles? Sunday morning, on our way back home, we decided to visit Pacific Crossroads Church, meeting at Santa Monica High School in Santa Monica. 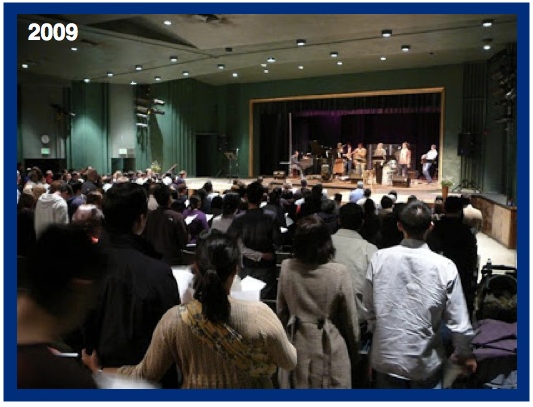 I visited Pacific Crossroads Church in 2009, back when they were meeting at University High School. Great experience. 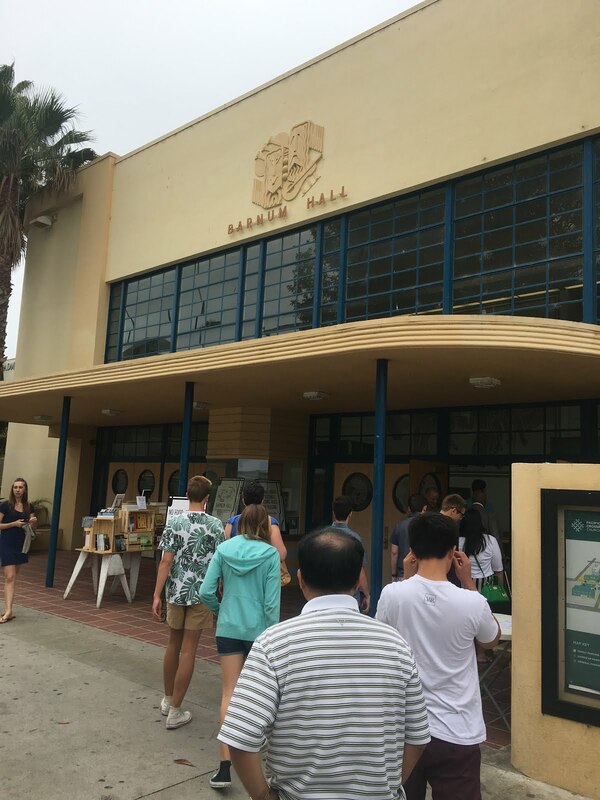 9am and 11am in Santa Monica at Santa Monica High School. 5:00pm St. John's Episcopal Cathedral (near USC, just south of downtown to Los Angeles). Above: Sunday evening service meeting at St. John's. 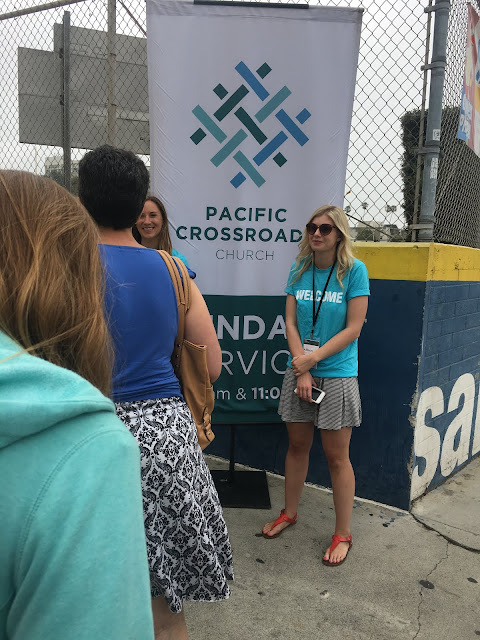 Pacific Crossroads has also launched two new churches in the San Gabriel Valley and Long Beach. Every local congregation has a beginning. 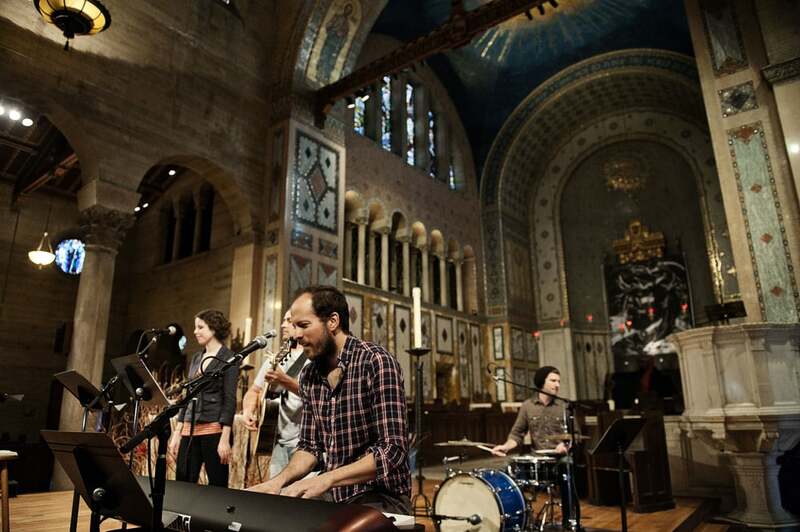 Pacific Crossroads was a church plant of Redeemer Presbyterian Church, New York City. In a similar fashion, Pacific Crossroads Church is committed to historic Christian doctrines - and to embracing what it means to live in a major urban city. 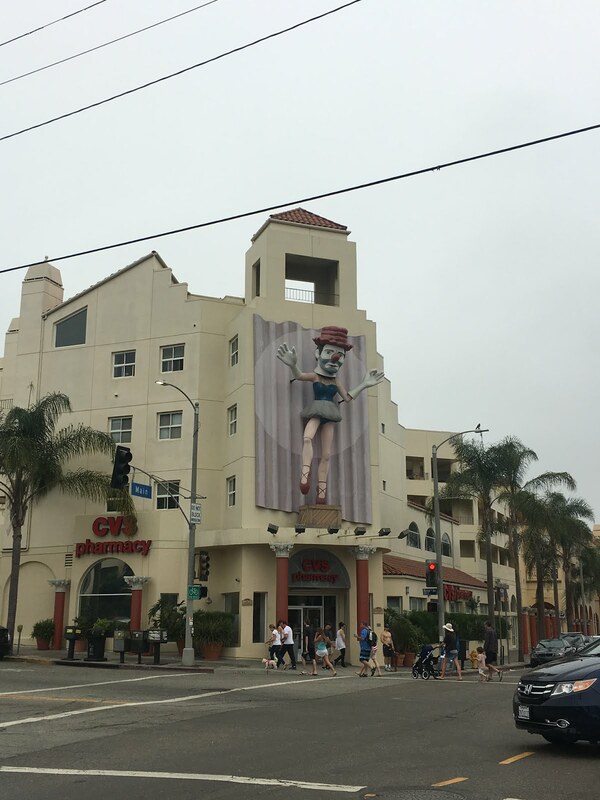 Driving up from Orange County on Sunday morning: the clown ballerina greeting us at the border of Venice Beach and Santa Monica. This is at the corner of Rose and Ocean in Venice. Parking for the church is located at the city garage at 4th and Olympic in Santa Monica. We parked the white family mini van. We just reached 200,000 miles. ... we just followed everyone else. Lots of signs and friendly greeters helped. A bit of a walk, but really worth it. The church uses the Santa Monica High School's black top, setting up numerous pop up tents, with info on opportunities to serve in the city and connect in small groups during the week. Similar to other churches renting space in public schools, a crew of volunteers set up and tear down everything every single week. 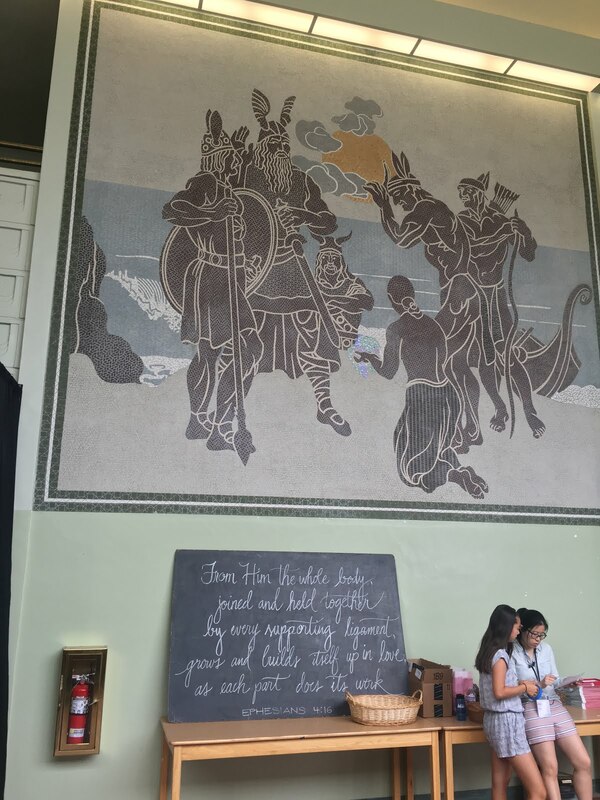 The church service is in Barnum Hall - the school auditorium. A small book table outside the entrance. I like the saw horses. 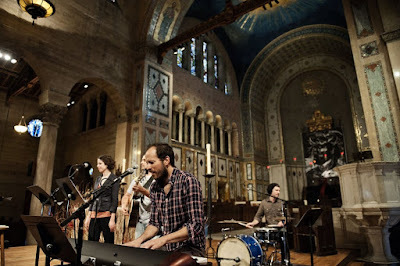 The church meets in the school auditorium, with contemporary - but not overwhelming - worship and music. Senior Pastor Rankin Wilbourne is gifted speaker, with a rare gift of the brilliant intellect, and challenging biblical teaching. Outstanding sermon. I mentioned that Pacific Crossroads is committed to both loving God and loving the City of Los Angeles. 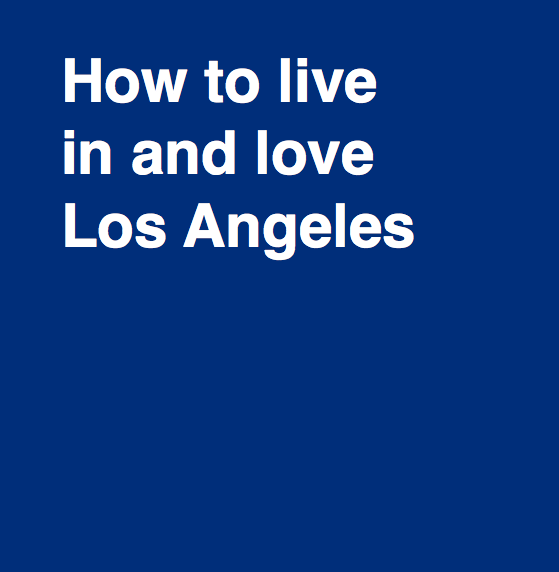 Several years ago, Rankin went through a unique Sunday morning sermon series called "How to Live In and Love Los Angeles." Obviously, I loved that title - and the series as well. Here's a link to one of the messages from that series called "What Does It Mean to Love the City of LA?" Even if you don't consider yourself particularly religious, it's worth listening to. The Sunday we visited, Pastor Wilbourne was just about to leave on sabbatical. 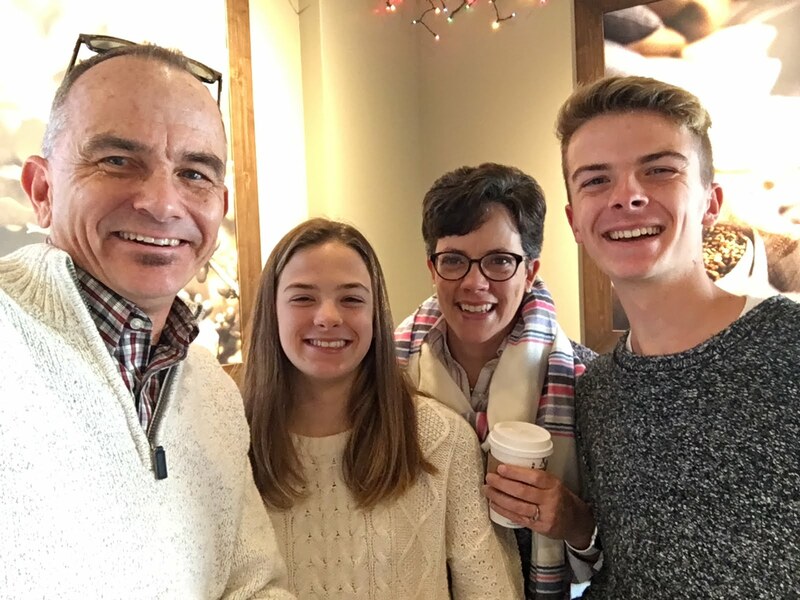 He and the other pastors took time to commission the lay leadership of the church. While Rankin is back, regardless of who is speaking, the sermons are relevant, engaging, and challenging. The church, including the lay leadership, really reflects the mult-ethnic nature of Los Angeles. Heading out, another look at the small book table near the entrance. Similar to when I visited many years ago, I highly recommend Pacific Crossroads, whether you're a Christian or just curious what it means to follow Jesus Christ. 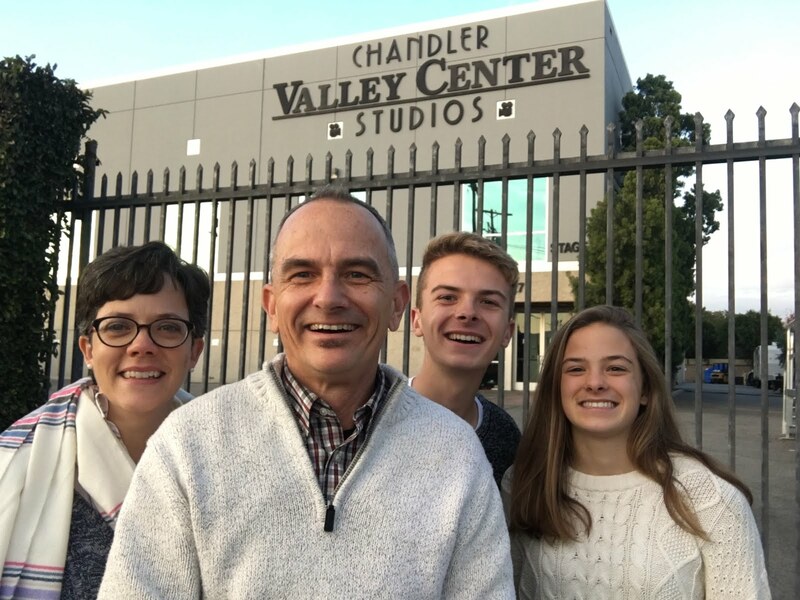 The church offers numerous for personal growth and support --- as well as living out the gospel in the surrounding community through acts of mercy and justice, coming alongside the under served and needy, and living in and loving Los Angeles. 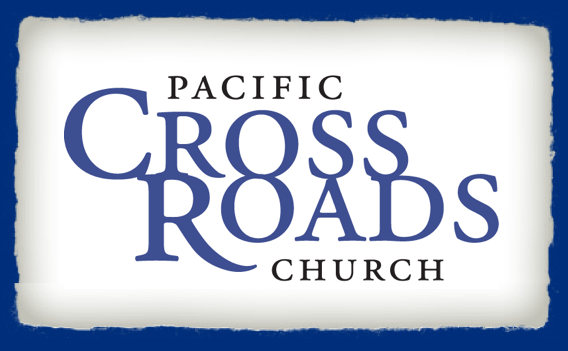 Here's a link to the Pacific Crossroads website.